It was very early in the morning at the concentration camp in Auschwitz at the end of July, 1941. The alarm had sounded in a very aggressive manner, heralding the escape of some prisoners. It was the tradition of the deathly camp that if one prisoner escaped from any of the cell blocks, ten prisoners would be executed as a consequence. Nine men had already being called and were to be taken to Block 13, the death block where those sentenced are left to die by starvation! The tenth named turned out to be Franciszek Gajowniczek. Spontaneously he exclaimed in utter despair: “O my poor wife, my poor children. I shall never see them again”. As this was going on, one of the inmates was attentively watching with deep and suggestive introspection. Immediately after this outburst from Franciszek, the inmate who had been keenly following the scene went to the commandant and whispered something. And after a brief discussion, the commandant announced that Franciszek Gajowniczek would no longer be among those to be executed as one of the inmates, Prisoner 16670, had offered to die in his place. Consequently the prisoner who chose to die was taken with others to the death point where they were subjected to acute starvation, torture and left to die successfully. The man who offered to die was the last to die, in fact he could not die after two weeks of going without food. Consequently he was given a lethal injection of carbolic acid and left to die on August 14, 1941. It was later discovered that the prisoner 16670 was a Polish priest of the Order of the Conventual Franciscan friars, named Maximilian Kolbe. Recalling this event after 53 years at the age of 93, Franciszek who was spared from death declared that Fr. Kolbe’s act of man’s humanity to man was a deep expression of God’s divine mercy for him; that is God’s divine sufficiency to humanity’s deficiency. During his homily on the canonization of Maximilian Mary Kolbe on the 10th of October 1982, late Pope John Paul II, who is today being canonized, said that St. Kolbe’s act was an absolute literal demonstration of our Lord’s words in the gospel of John (15:13) “there is no greater love than this that a man should lay down his life for his friends”. There could be some moments when we find ourselves on certain disparaging crossroads or near death situations and suddenly there comes an unexpected relief like in the case of Franciszek. Often we unfortunately attribute such amazing aids as coming from the point of view of our connections or intelligence and so on; however they are elements of divine mercy; God’s sufficiency at work in our lives! The above situation could have been the apt description of what the apostles faced when our Lord Jesus Christ was arrested, bullied, killed and buried. They were devastated and scattered (Zech.13:7). However the resurrection was meant to mark a turning point for them (to bring them back from where they have been scattered- Isaiah 54:7) but they were still afraid, confused, faithless and lacked peace. St. Augustine defined peace as the tranquillity that comes from order and order is the proper arranging of all parts. This means that peace results when things are properly ordered within and outside of an individual. From what happened when Jesus Christ was arrested, one could attest to the fact that the apostles lost every sign of order as they lost hope and were ultimately disturbed; peace went on vacation and they were scattered (Matt.26:31) . They actually took refuge at the upper room where they locked the doors for fear of the Jews (John 20:19). The upper room became for them a comfort zone; but how long will they continue to be inside a locked room? Often we build upper rooms for ourselves not for prayers like on the day Pentecost (Acts 2:1) but for hiding on account of fears and deficiencies, from facing the reality of our situation, from being genuinely focused and truthful to ourselves! Coming to them on the evening of the resurrection day, the initial words of our Lord to them captured the situation they were in. To them he said: “Peace be with you!” This phrase should be understood as addressing their situation. Jesus couldn’t have wished them peace if they were enjoying peace. Hence he meant to tell them to replace their troubled minds and confused heads with peace from the power of the resurrection. When our Lord appeared to them he said “peace be with you” not just once but twice and yet one more time after eight days when the doubting Thomas was present. The emphasis on PEACE is not accidental but showed its expediency. It is also understandable that one challenge led to the other. With the absence of peace the apostles became hopeless and faithless. It needed the physical presence of Jesus Christ to lead them out of fear into faith, from devastation to peace. There is actually a link from disillusion to fear and lack of divine touch and connection. We could thus say that there was at that point the absence of faith, peace and divine mercy but the resurrection of Jesus was meant to lead them to the realisation of all these divine benefits. Our Lord Jesus Christ came to undo our past and to restore our loses. By the power of his resurrection our fear is defeated and our faith is renewed. Thomas in the gospel of today stands as a representative of our doubt and faithlessness. He was not around the first time our Lord appeared to the others. We were not told where he went. He missed that first encounter with the risen Lord; we also remember that on that first meeting our Lord breathed on them and said “receive the holy spirit” (John 20:21). After, he also sent them on the mission to evangelize and forgive sins. Being absent from the encounter with Christ and the reception of the Holy Spirit of God, (though he was lucky to be present on the day of Pentecost Act 2:1ff) Thomas was not renewed with others at that time, so he continued to live in the past condition of fear, doubt and lack of peace. No wonder he stood his ground that he would not believe unless he sees and touches. This is contrary to the divine injunction that our faith should be certain even when we have not seen and should also be an assurance of the things we hoped for (Heb. 11:1ff). When we are disconnected from God through our absence from the sacraments and from hearing the word of God, we live in fear and lack the needed peace. When we are disconnected from God we run the risk of being unable to receive the infusion of the Holy Spirit and the divine commissioning. Like Thomas we fall into doubt and disbelief because we missed the divine action. The resurrection of our Lord Jesus Christ is the highest expression of divine mercy which began with his death on the cross which marked the paying of our debts and our liberation from sin and death. It was actually divine mercy that can describe the coming of Jesus Christ in our midst. It was divine mercy that moved him to die for us even when we were still sinners (Romans 5:8; Psalm 78:32). That same divine mercy brought about his resurrection because if he did not rise from the death we could have been at lost with vain hope (1 Cor.15:12-14). 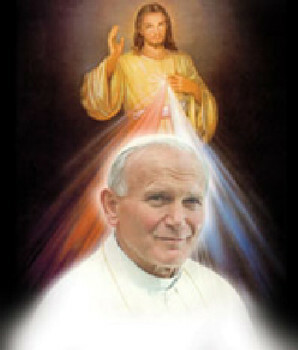 WE are alive today on account of divine mercy, our success is based on divine mercy. With God’s mercy on us we are expected to show mercy to others (Luke 6:36). If one looks round the world, one would discover that one of the problems facing our worlds is disaffection and inattention to mercy for one another. The uprisings and wars around our globe are products of lack of mercy and pardon. When peace cannot be found we make a harvest of disunity, aggression, anarchy, disaffection and total chaos. God not only sent his Son to die on account of our sins and cancelled our debt he also granted us pardon and mercy. No wonder that on this day our Lord in his commission told the apostles to forgive sins; that is to grant pardon. This is an indication that with the resurrection of Jesus Christ divine mercy has been granted to us. It is one of the indications of the sacrament of penance through which our sins are forgiven and we are granted mercy and pardon. Let this day be for us a day to reflect on God’s mercy in spite of our defection and qualification for punishment. Like Franciszek was saved from death by Kolbe’s human affection, we all are saved by God’s passionate divine mercy. Let this day be an opportunity for us to drop the negativity of fear and rejoice over the resurrection of Christ. Let it be a moment of faith for us to undo the doubts of Thomas. Let it also be for us an opportunity to show mercy to others especially those who have wronged us knowing fully that God is always forgiving us and granting us divine mercy without which we cannot stand (Psalm 130:3). As we celebrate the radiant mercy of God which our Lord Jesus Christ brought to us by his death and resurrection, let us be mindful of the fact that divine mercy is a facility that is open to us all and let us also be mindful of those who looking forwards to the embrace of forgiveness and mercy from us. We also turn to our most recent Saint Pope John Paul II to intercede for us all as we earnest look forward to God’s divine mercy. Have a blissful Sunday and remain awesomely blessed in the week ahead! Fada Bonnie. I thank God for you. More sauce to your elbow. Keep on keeping on in the work of the Lord.